Washington Capitals Hockey Player Scores Winning Goal, Draws Racist Tweets : The Two-Way Washington Capitals hockey player Joel Ward scores winning goal and is subjected to racist remarks on Twitter. Ward, who's black, says the comments didn't ruin his day. Washington Capitals right wing Joel Ward, center, is mobbed by teammates after his game-winning goal against the Boston Bruins. Hockey fans in the nation's capital are savoring an underdog victory: last night, the Washington Capitals knocked the Boston Bruins, last year's Stanley Cup champions, out of the playoffs. 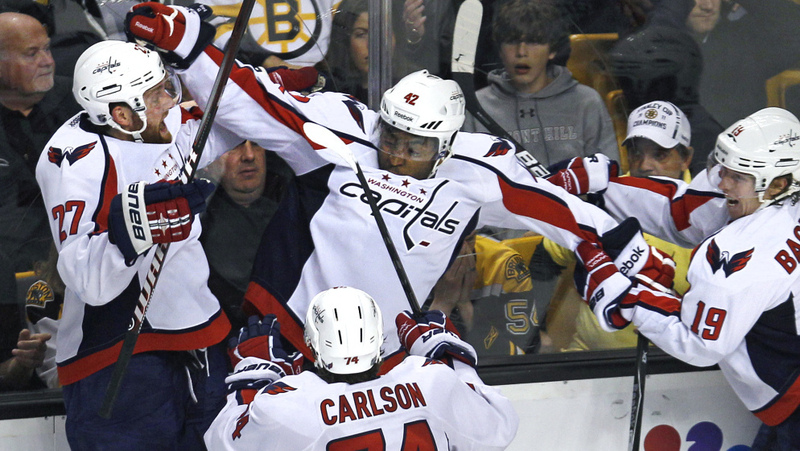 Nearly three minutes into overtime, Caps right winger Joel Ward fired a puck past Bruins goalie Tim Thomas, ending Boston's hopes for a repeat of the 2011 victory. The final score: 2-1. For a very few Boston fans, the disappointment morphed into vitriol - on social media. Vile tweets against Ward appeared on Twitter, notes Capitals Outsider - and one of them was a death threat. Joel Ward is black, playing in a professional sport that is overwhelmingly white. Outraged social media users have thronged web pages, offering messages of support. Today the Bruins released a statement condemning the comments. So did the Caps: "We are aware of some of the racial comments that were made following our overtime victory last night and are outraged by those individuals who expressed such ignorant comments. We find such comments to be totally unacceptable." It was rough going. And not when I was playing in Montreal or Toronto, but when I went to the states, in Chicago, in Detroit and in New York, you know, I experienced the racial slurs and remarks that were directed towards me. But, you know, I had geared myself up for that and I told my self, Willie, you're a black man and be proud of who you are. Just go out and play hockey and try to represent the hockey club to the best of your ability. O'Ree spent two seasons with the Bruins: in 1957/58 and 1960/61. Meanwhile, Joel Ward told USA Today while he was shocked by the comments, "it didn't ruin my day". He added: "I'm definitely getting a lot of support...there have been a lot of Boston fans who have supported me, which is very cool to see. No hard feelings from me. This is a game."